It is important when the content database need to upgrade the gui interface can not able to complete this operation.you have to use stsadm for doing that. Windows SharePoint Services 3.0 uses e-mail handlers to route incoming e-mail from virtually any e-mail client to a list in your SharePoint site. Each e-mail-enabled list is associated with a unique e-mail address, and each e-mail handler is associated with a particular list type. 1) Check Central Administration -> Operations -> Incoming E-Mail Settings is correctly configured. 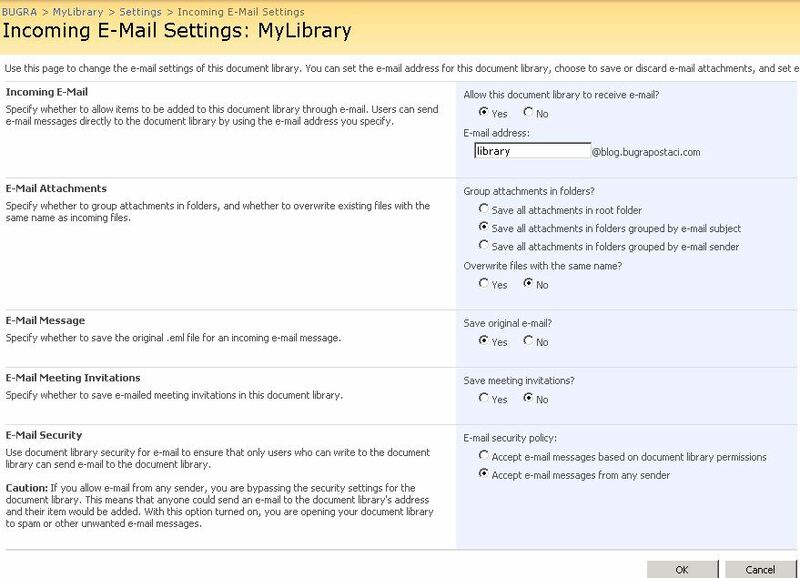 2) Check your library – Settings-> Incoming E-mail settings is correctly configured. At this point i want to tell about the process of an incoming email distribution. When you send an email to a sharepoint list first your mail is delivered by your mail server and pass through the your sharepoint machine smtp server. It stored c:\inetpub\mailroot\drop folder with a file format of eml. 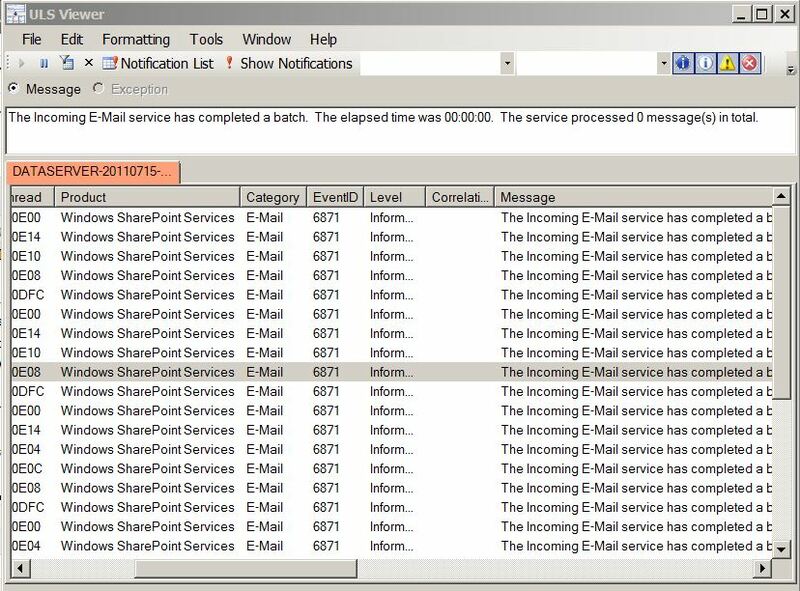 The timer job of “Windows SharePoint Services Incoming E-Mail” is monitoring your mailroot\drop folder and when it find an email it process this mail and deliver the attachments to destination document library. 3) Check your Mailroot/drop folders stores eml files. 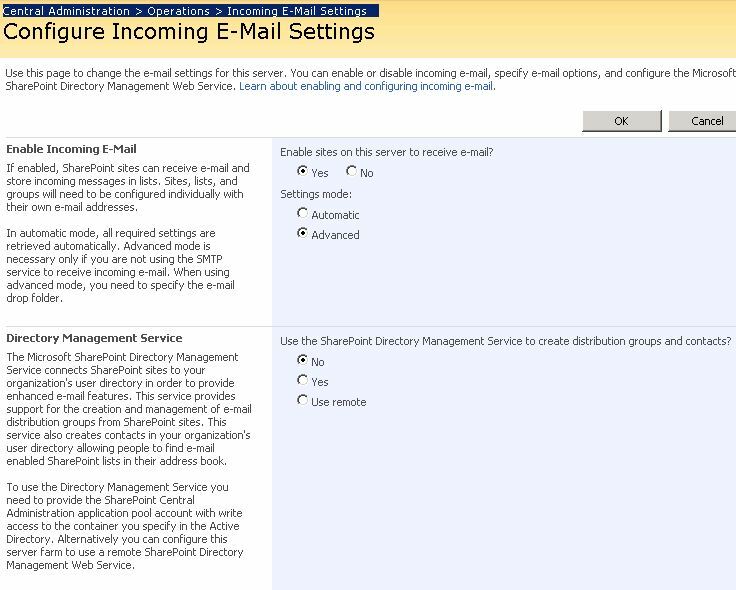 Incoming e-mail uses the Microsoft SharePoint Directory Management Service to connect SharePoint sites to the directory services used by your organization. If you enable the Microsoft SharePoint Directory Management Service, users can create and manage distribution groups from SharePoint sites. SharePoint lists that use e-mail can then be found in directory services, such as the Address Book. You must also select which distribution group requests from SharePoint lists require approval. The Microsoft SharePoint Directory Management Service can be installed on a server in the farm, or you can use a remote Microsoft SharePoint Directory Management Service. 4) If you are using Microsoft SharePoint Directory Management Service Check Microsoft SharePoint Directory Management Service is running.